Built with a dual focus on design and premium functionality, it makes a stylish, yet practical addition to any room. 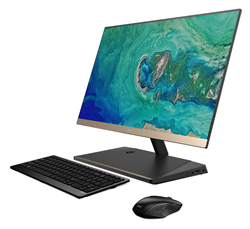 “We think customers will be delighted with the elegant aesthetics and convenient feature set of our newest all-in-one desktop,” said Frank Chang, Acer America senior director–stationary products. Acer has expanded its all-in-one desktop offering in the United States with the new award-winning 23.8-inch Aspire S24, its slimmest ever featuring a side profile of only .235 inches. Built with a dual focus on design and premium functionality, it makes a stylish, yet practical addition to any room. A black and matte gold color scheme lends the ultra-slim S24 a luxurious appeal. The Full HD IPS screen delivers a vivid and crisp viewing experience with accurate colors up to 178-degrees. An ultra-narrow .106 inch bezel provides a 90 percent screen-to-body ratio, meaning more viewable space for seeing digital images, spreadsheets, movies and more. Offering an 8th Generation Intel® Core™ i5 processor and 12GB dual channel DDR4 2400MHz memory, the Aspire S24 tackles immersive entertainment and daily tasks with ease, even while multi-tasking. Two 2W 2.1 channel speakers with a subwoofer design enhanced with Acer TrueHarmony™ and Dolby Audio™ Premium infuse entertainment with deep bass as well as excellent clarity and volume. The system is also the perfect device for editing and storing photos and videos with 1TB(1) of storage space. The system’s base supports wireless charging for Qi-enabled devices, allowing customers to power their mobile device by simply laying it on the charging area without chasing plugs or dealing with messy cables. Designed to be adjusted with minimum effort using just one hand, it provides superb ergonomics and maximizes productivity and viewing comfort with a -5 to 25 degree tiltable display. Integrated Acer ExaColor™ increases color saturation and contrast for more vivid, vibrant images, while BluelightShield™ and Flickerless™ technologies reduce blue light and screen flicker for more comfortable viewing. Intel® Dual Band Wireless-AC (802.11ac 2x2 MIMO) technology provides fast and reliable wireless network connections. (2) The system is also outfitted with Bluetooth 4.2, 802.11ac and Gigabit LAN and comes with a wireless keyboard and mouse. Other connectivity options include a USB 3.1 Gen1 Type-C port, three USB 3.1 Gen1 Type A ports and a USB 2.0 port for connecting to peripherals and digital devices. HDMI supports a second display and a SD card reader is compatible with a wide variety of memory cards available today. The Acer Aspire S24-880-UR12 all-in-one desktop will be available in the United States this month for $879.99 MSRP with a one-year limited parts and labor warranty(3). Founded in 1976, today Acer is one of the world’s top ICT companies and has a presence in over 160 countries. As Acer looks into the future, it is focused on enabling a world where hardware, software and services will infuse with one another to open up new possibilities for consumers and businesses alike. From service-oriented technologies to the Internet of Things to gaming and virtual reality, Acer’s 7,000+ employees are dedicated to the research, design, marketing, sale, and support of products and solutions that break barriers between people and technology. Please visit http://www.acer.com for more information. © 2018 Acer America Corp. All rights reserved. Acer and the Acer logo are registered trademarks of Acer Inc. Other trademarks, registered trademarks, and/or service marks, indicated or otherwise, are the property of their respective owners. All offers subject to change without notice or obligation and may not be available through all sales channels. Prices listed are manufacturer suggested retail prices and may vary by location. Applicable sales tax extra. 2) Based on IEEE 802.11ac draft specifications. Actual speed will vary depending on network conditions and environmental factors, including volume of network traffic and density of surrounding structures like walls. An 802.11ac wireless equipped PC requires an 802.11ac router to work properly. 3) Limited warranty agreement applies. For a copy, write to Acer Customer Service, P.O. Box 6137, Temple, TX 76503.